American stage and screen actress Gene Tierney died on this date in 1991. She was 70 years old. Known as one of the great beauties of Hollywood, Tierney is best remembered for her portrayal of the title character in the 1944 film Laura. In 1999 this film was added to the United States National Film Registry by the Library of Congress. Miss Tierney was also nominated for an Academy Award for Best Actress for her performance in Leave Her to Heaven. In a 1979 interview on The Mike Douglas Show, Tierney states she first saw Oleg Cassini at the Mocambo nightclub while she was still quite young. She later met him at a party and thought him very charming. They married on June 1, 1941. Although they divorced, she said they remained good friends. 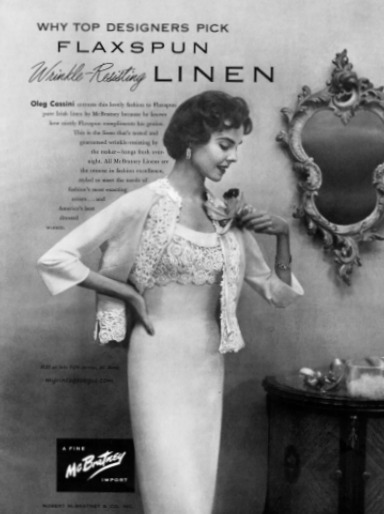 Born to Russian aristocracy, Oleg Cassini began his career as a costume designer for Paramount Pictures in 1941. He worked for Hollywood's major film studios, dressing Rita Hayworth, Audrey Hepburn, Natalie Wood, Marilyn Monroe and many more of the industry's most glamorous stars. 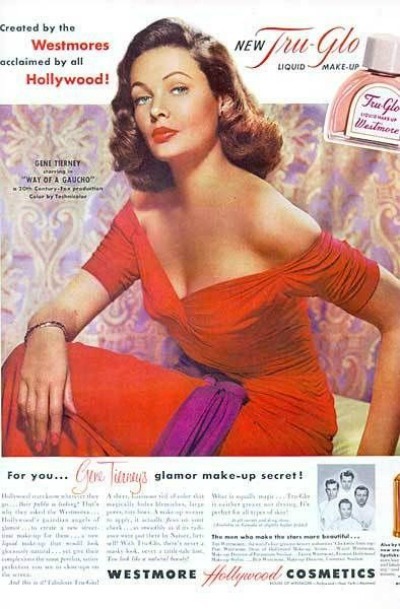 Oleg Cassini designed the costumes for Gene Tierney's starring role in The Shanghai Gesture, a 1941 film with Walter Huston and Victor Mature. Lord & Taylor featuring his chic styles. 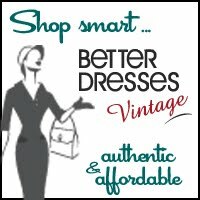 He thought it important to make a fashionable and affordable clothing line available for the average woman. Shortly before her wedding to John F. Kennedy, Jacqueline Kennedy met Oleg Cassini. 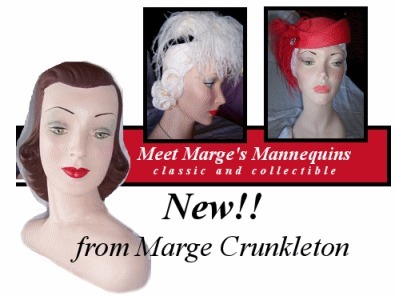 He quickly became one of Mrs. Kennedy's favored designers. Cassini's stature in the design world increased tremendously in 1962 when Jacqueline Kennedy appointed him as her exclusive couturier. 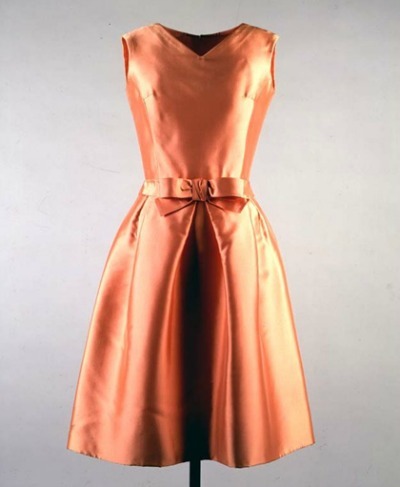 He and Hubert de Givenchy would remain Kennedy's designers of choice and were responsible for defining her signature style and elevating her to an international fashion icon. 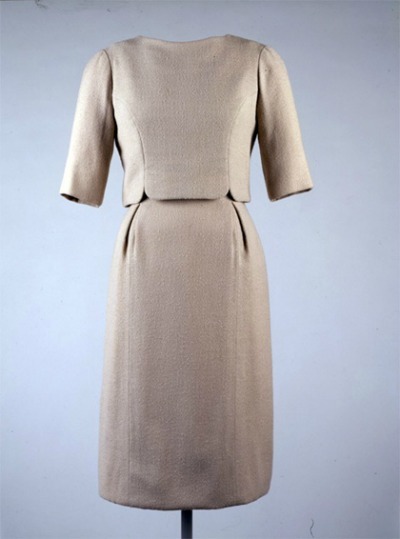 Beige wool crepe dress with overblouse worn by Mrs. Kennedy to the January 20, 1961 inaugural ceremonies. Cassini preferred a formfitting silhouette rather than the traditional A-line designs of that era. 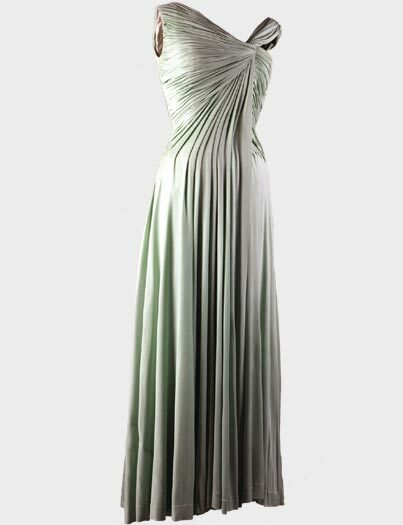 The celedon green evening gown featured above was designed by Oleg Cassini in silk jersey for Mrs. Kennedy to wear in 1962 to a White House Dinner honoring Nobel Laureates of the Western Hemisphere. Although the sleeveless, knee-length dress shown above is elegant enough to be worn to a cocktail party, Mr. Cassini designed the Silk Zibeline day dress for The First Lady's visit to India's White Palace. The fabric was rigid enough to maintain its composure in India's heat and the color and sheen ensured Mrs. Kennedy could be seen from the distant shores as she disembarked from the boat. Oleg Cassini is quoted as saying, "The First Lady must be a leader. She must not be a follower."